The 10th generation of the Honda Civic is excellent. This is the latest Honda Civic that is heading to our showrooms and the 10th generation is an all-new creation that will impress. Indeed, Honda says it has benefited from the biggest single model redevelopment programme in its history. 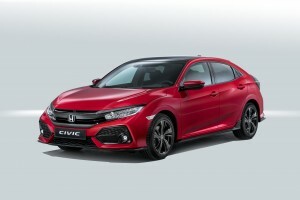 There’s a lot riding on the new Civic which will lead Honda’s drive into boosting sales with many customers around Europe believing the Civic is synonymous with their brand and this rejuvenation will be well received. There’s a lot to enjoy in the new Honda Civic with new chassis and body construction and improved vehicle aerodynamics. With a 40-year heritage, Honda says its Civic is true to the original concept of having a car worthy of all people with a marriage of sporty styling, versatility and practicality as well as its distinctive design. The engineers have worked hard on improving driving dynamics and there’s an all-new platform for the Honda Civic to help underpin a rewarding and agile drive. The bodyshell itself is rigid and lightweight and incorporates new construction techniques. Drivers will also find the new Civic has a lower centre of gravity and a new suspension system will deliver a fun and engaging driving experience. In the cabin, the Honda Civic has a raft of new additions as well as new technologies in a refined and uncluttered interior. A lower seating position will bring the driver a better feeling of connecting with the car. There’s also a new connectivity and infotainment system available. However, the all-new Honda Civic also brings two new VTEC petrol engines that have been developed specifically to deliver a more efficient and powerful driving experience. One of them, a 1.0 litre three-cylinder unit, is making its European debut, while the other is a 1.5 litre turbocharged four-cylinder engine that will replace the current 1.8 litre engine. Both of the new engines have a choice of a CVT automatic or six-speed manual transmission – which has been redesigned to deliver better performance. Among the new safety features is a collision mitigation braking system, lane departure warning and a road departure warning system which features a windscreen-mounted camera detector to recognise when the Honda Civic is veering from the road. There’s a lot to like about the new Honda Civic and it’s a great creation which will surely be a big success for the carmaker. This entry was posted in Car Leasing, Cars, Family Car, New Cars and tagged Honda Civic by Steve Lumley. Bookmark the permalink.